To make a virgin coconut oil there are several processes to pass through, but we will teach the normal and simplest ways to make the best and healthy coconut oil right there in your house without having to go to the market to buy coconut oil anymore. It's normal to have doubts if this methods we are listing will actually work out by producing more oil for you as much as you need it. The answer to your questions and doubts is a big YES. This is the most common way to make a coconut oil without having to stress yourself or even waste your gas or kerosene trying to boil the oil out of the chaff, or cooking the coconut overnight in order to get more oil. This is the simplest and easiest method to make fresh coconut oil right from your home using your own utensils at home. Coconut oil offers an assortment of medical advantages and can be utilized for cooking and also skin and hair mind. 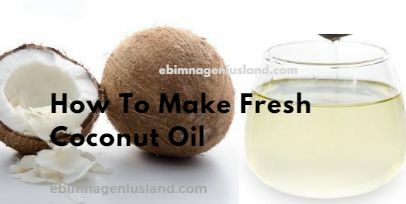 You can influence your own particular virgin coconut to oil at home utilizing a coconut and a couple of basic devices. The first step to take is to make sure you use a matured coconut that is brown in color not the one that is white in color, the reason is that a matured coconut will give you more oil than that of white coconut. When you cut the meats of the coconut into pieces, it helps the meat to be grounded faster and easily using a sustenance processor or grinder, while some other people uses mortal and pitsle to pound theirs . All these equipment's are useful depending on the one you have, just make use of it. Some tutorials will tell you that you should soak it in a warm water in order for the oil to show on easily and faster, but the best and easiest way to have more oil from the coconut is by soaking it in a cold water and making sure that the water on it is really higher and larger than the quantity of the coconut inside the water inside a basin or any cup depending on the quantity of the coconut you provided. Always know that the lager the coconut the high quantity of oil you get. Make sure you keep the basin out of the reach of children so that it will not be poured away thinking that its a dirt or you can equally keep it inside your cupboard or under the bed. After 24 hours, you will notice that the oil from the coconut is creamy in color, which is already on top of the oil. When the oil is seperated from the water which is absolutely white and creamy in color, all you have to do is to make sure that there are no remains of the oil on top of the water. While cooking the oil, remain there in order for the oil not to change to black color, if yours changes to black that means you let it burn, but when yours remains the same color as water or creamy, then you are a genius and that means you followed the actual steps as we stated on this article. When you let the oil get at least cold and when yours still remains thick when cold, then you have to continue with the cooking, but when yours is still very light and fresh even when it's cold, then you are a pro. Coconut oil can be applied on your hair to enable fast growth, and also kills dandruff. It can also be applied on your skin for soft skin. It can be applied in your laps, if there is any black spot or even scratch. Don't forget that you can also drink it because it's medicinal to the health.